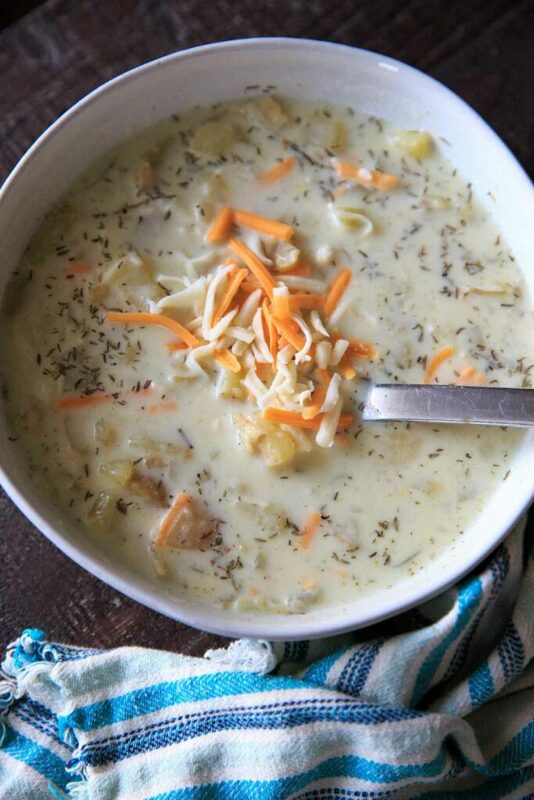 Chunky potato soup with loads of herbs makes for a lovely comforting cold-weather one-pot meal in the fall. Make it creamy if you want! Gluten-free with dairy-free option. Thank you to iHerb for sponsoring this post! Make sure to scroll to the end for a special offer! As always, all opinions are my own. 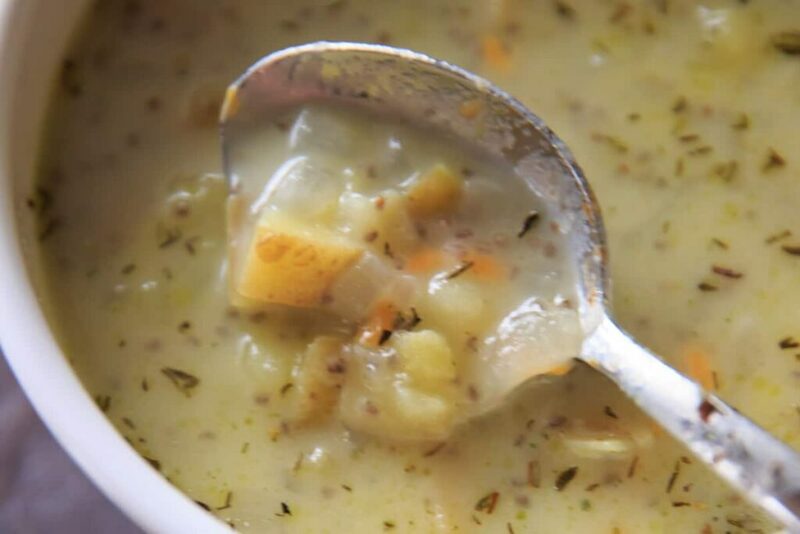 While I have learned to love all kinds of soups now, I used to prefer ones that I had to chew. Like chunky potato soup! I’m actually surprised I haven’t attempted to make this yet myself, but when I was thinking of something that screamed “fall” to me, I was reminded of this idea. Even though North Carolina hasn’t officially figured out it’s fall yet, there were two hurricanes that came through my area while I was testing this recipe that brought a ton of rain – and a great need for comfort food. Working with iHerb made preparation for this recipe easy! 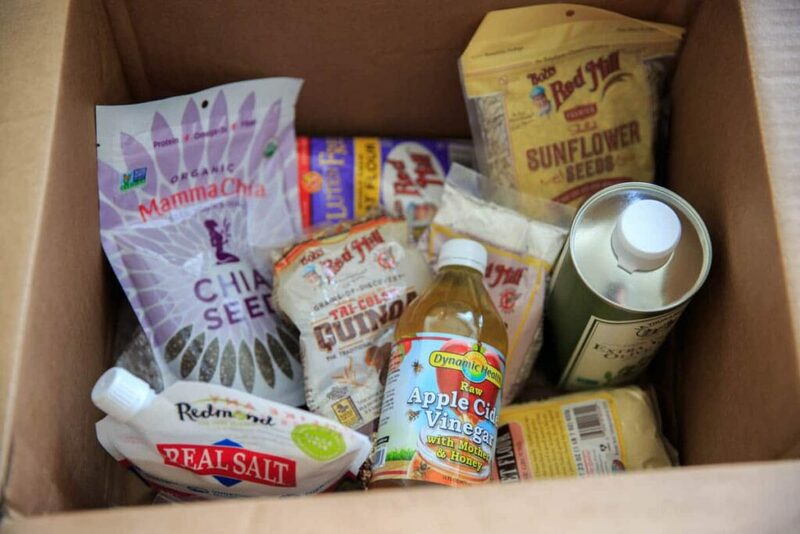 With over 5,000 grocery items, they make finding what you need a breeze. I also ordered some ingredients for a quinoa bread recipe, coming to you soon! Fresh ingredients needed: gold potatoes, onion, celery, and milk or cream. This was my first time using a vegetable bouillon but what I loved about the Rapunzel brand that iHerb carries is that it already has herbs included. I wanted to make my soup extra herby, so I added more – but this bouillon already has parsley, celery, garlic, basil, turmeric, lovage and dill. They also carry a bouillon with sea salt instead of herbs. The bouillon is a great item to keep in your pantry for those times you don’t have broth or you want to add an extra boost of flavor, especially with all those herbs! I like to use gold potatoes here because they hold their shape well, but you could use russet if that’s what you have. I also use an immersion blender to blend about half of the potatoes, but you can do without blending or even blend all the way if you want a creamy, smoother soup. Now, about those chia seeds – did you know you can use those to thicken soups?? I tried cornstarch in a couple batches but when I learned that chia seeds could do the trick I thought that was genius! When you add chia seeds to liquid they become thick and sort of like jelly, so it makes sense. Also, chia seeds have fiber, protein, and omega-3 fatty acids that boost the nutrition of this meal way up! If you don’t like the idea of seeds in your soup, you can replace them with cornstarch (or flour, if you’re not worried about gluten-free). Just be sure to mix it in with a bit of cold water first before adding to the soup. I also like to add a dash of apple cider vinegar in soups because it helps balance out the flavors. It also has a bonus of adding some antioxidants and amino acids. Some even say it has superfood status (as do chia seeds!). Replace some of the water with either vegetable broth, to make it heartier, or milk/half and half to make it creamier. I liked the balance of 3 cups water + 1 cup half and half the best, but I did play around with the proportions and encourage you to do the same! Use non-dairy milk to keep it vegan. I suggest full-fat canned coconut milk or coconut cream. Saute the onion first! I do like the flavor of the sauteed onion with a little bit of extra virgin olive oil first, instead of just dumping everything in – but do be aware the it may cause an “oil film” on the top of your soup! And of course, add some cheese if you want! My favorite is cheddar. Lucky for you, I have a special iHerb discount offer for you to buy most of what you need for this chunky potato soup! Returning Customers can get a discount off their iHerb order, but for a special October offer, *New Customers can get an additional $10 off their minimum $40 order by clicking here! 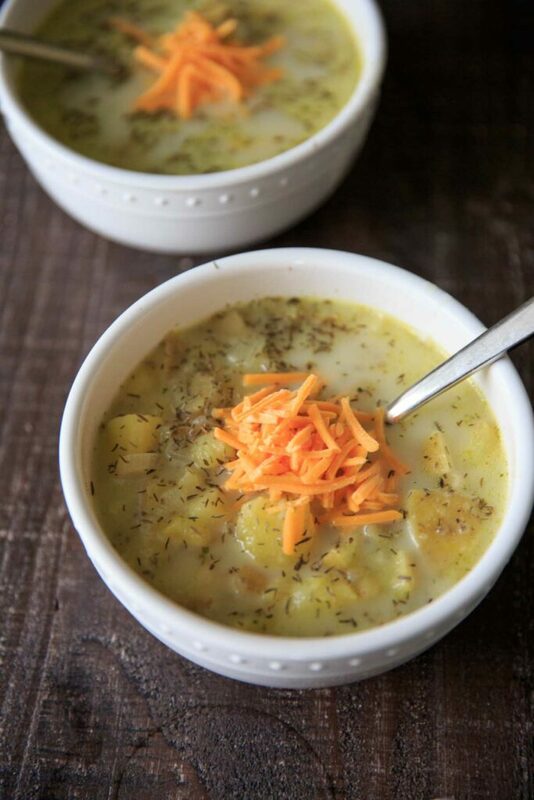 Chunky potato soup with loads of herbs makes for a lovely comforting cold-weather meal in the fall. Make it creamy if you want, Gluten-free with dairy-free option. 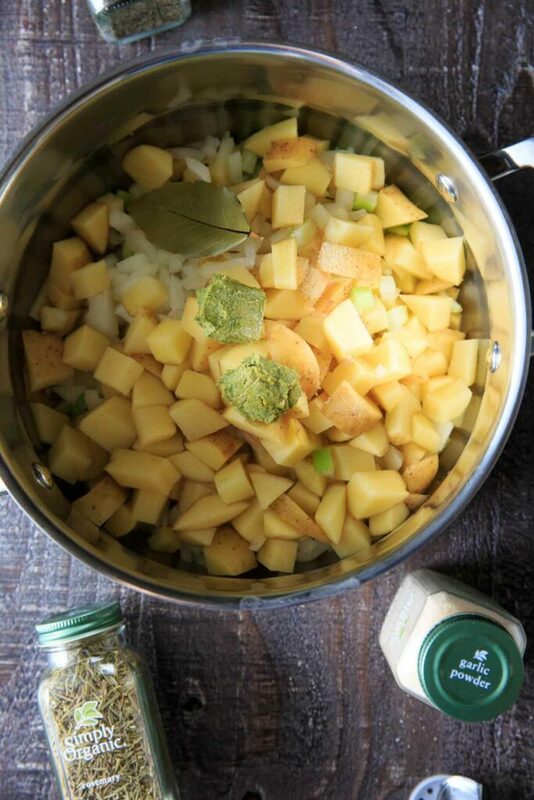 In a large stock pot, add chopped potatoes, celery, onion, garlic, bouillon cubes, water and bay leaf and bring to a boil. Reduce heat to low, cover and let simmer until potatoes are tender, about 12-15 minutes. Meanwhile, in a small bowl, combine milk with chia seeds (or corn starch) and let sit while soup is simmering. Add milk mixture to potatoes and stir to combine, cooking for an additional 2-3 minutes. Mix in apple cider vinegar (if using), salt and pepper, and additional herbs. Remove bay leaf. Option to use an immersion blender to blend half of the potatoes, or leave them as-is for a chunkier version. Serve warm with shredded cheese. *If you use organic potatoes you can leave the skin on. 1/4 teaspoon garlic powder is equivalent to 2 cloves garlic. 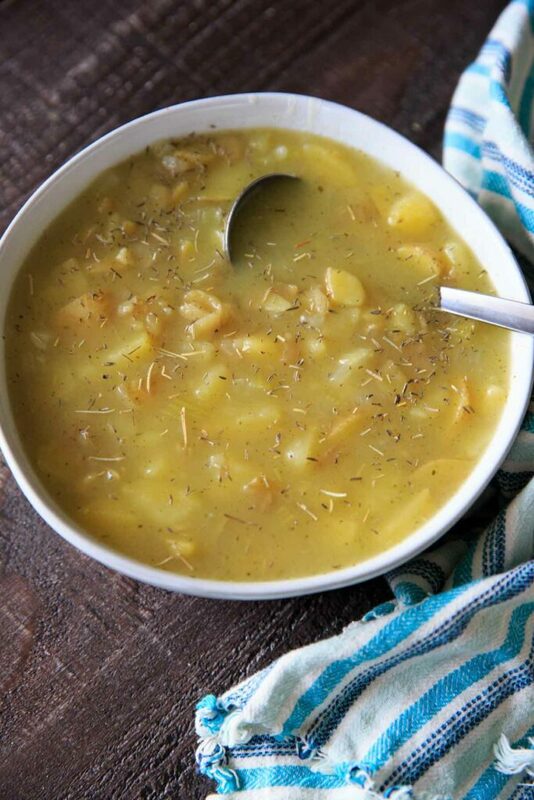 The optional apple cider vinegar will help to brighten and enhance the flavors of the soup. 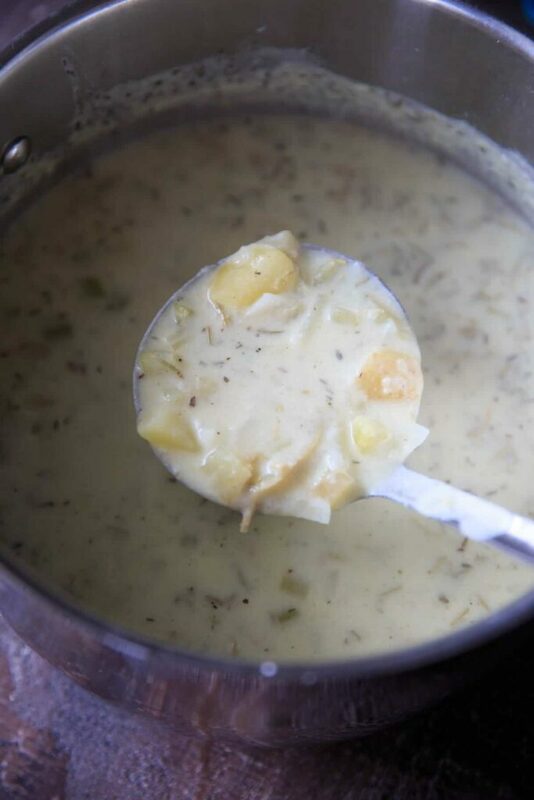 Can use vegetable broth in place of the water, or substitute more milk for some of the water to make it creamier. To make it vegan: use a dairy-free milk (like full-fat canned coconut milk) and skip the cheese or use a vegan alternative. This is just what I was planning to make for dinner. Thank you for the inspiration! 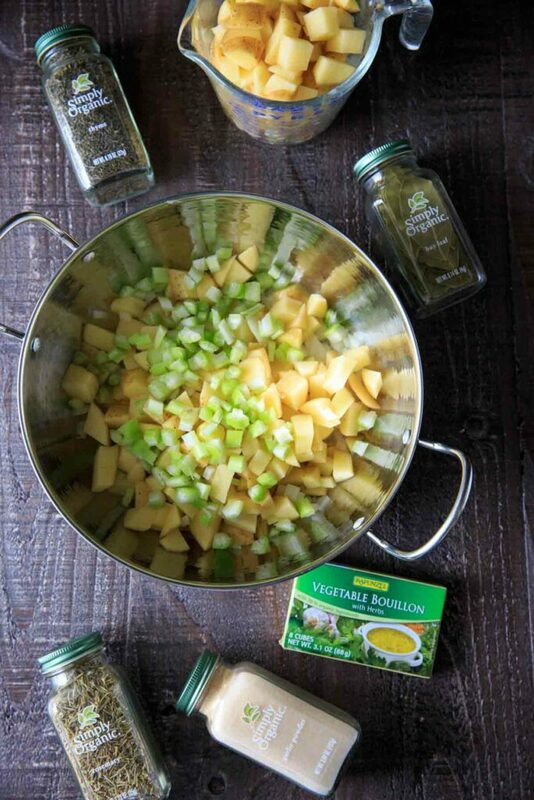 I love a hearty blend of potatoes and herbs – it’s so comforting. I also use an immersion blender for my soups. It makes clean up a breeze.